Biodiversity in bloom, in my garden today. Remember that childhood game – was it called Memory? – where you were presented with a plate with a bunch of random things on it, then you were given a minute to memorise everything on it before reeling them off to score points?I’d be hopeless playing an adult version of this game with the flowers in my garden. Somehow, the more beautiful something is in bloom, the more likely it is that, while staring point-black at it, I won’t be able to recall its jolly name. 1. Blood red abutilons, or Chinese lanterns. Such fabulously underrated shrubs for tucking into the gaps under deciduous trees, and easy to strike from cuttings (according to Julian Matthews). I wonder why these gorgeous, if a little gangly, plants aren’t easier to buy. They must have fallen out of fashion. 2. Annual blue forget-me-nots. Jason’s ex-girlfriend planted these under the silver birches at the end of the driveway, and they return year after year in a chintzy carpet of baby blue. I adore them. 3. Bluebells. The perfect companion for forget-me-nots, with the same provenance. 4. I think this is the cute wee Australian wax flower, Eriostemon myoporoides ‘Profusion’, but I wouldn’t stake my life on it. 5. Dainty white thrift, Armeria maritima ‘Alba’. 6. Dinky English daisies, Bellis perennis. I love, love, love them, even if they hate, hate, hate Auckland’s humid climate. 7. Pansies. Aww, look at their happy little faces. 8. The last of the winter-flowering Primula malacoides. 9. I have no idea what variety these creamy rhododendrons are, but by summer they’re so riddled with thrips that it looks like someone spraypainted their leaves white. 11. False or Mexican orange blossom, Choiysa ternata. Horrible smelling beast, but rather lovely in my white garden. It reminds me that I must seek out a few plants of its posh sibling ‘Aztec Pearl’, which has smaller flowers but millions more of them. 12. It’s one of Murphy’s Laws of Gardening that the more you try to kill something, the stronger and healthier it will grow just to spite you. This pale lilac clematis fits into that category. It was here when I came and I moved it twice, with no thought for its welfare, but each time it bounced back. Meanwhile, every flamboyant ‘Nellie Moser’ and ‘Fireworks’ vine I have bought has met an untimely fate before its first season was out. 13. That teeny tiny blue flower is the very first bud to open on Sisyrinchium ‘Devon Skies’, a grassy little perennial that looks like a constellation of starry blue blooms in full flight in summer. 14. My friend Fiona gave me this one, and I think she said it was a fothergilla? 15. I bought this ti-tree last week because its name is Lynda. Well, close enough. It’s Leptospermum ‘Wiri Linda’, bred by Jack Hobbs. 16. Self-sown honeywort, Cerinthe major ‘Purpurascens’. I have a veritable forest of this stuff, and the bees are going bonkers for it. 17. Gah. Ranunculus. I’m giving up on them. This is my best bloom from over 100 corms. (For scale, notice how it is as small as a sprig of freesias.) I don’t know what the secret to big fat ranunculus is, but I wish someone would tell me! 18. Fabulously fragrant freesias. I have them in red, yellow, white and lilac. 19. Perennial ‘Bowle’s Mauve’ wallflowers are in bloom year-round in the garden in front of our stables. They’re so lovely. A favourite of my Grandma Clarice. 20. Purple-flowered honesty, beloved for its papery moon-like seed heads. 22. False Queen Anne’s Lace, Ammi majus. I’m going to try to dry some of this in summer; apparently the trick is to hang it upright through a mesh screen so that the lacy umbrella-like heads hold their shape. 23. My all-time favourite spring flower, Orlaya grandiflora. A hardy annual that self-seeds like the world’s prettiest weed every year. I wouldn’t be without it. 24. The first of my granny’s bonnets (Aquilegia) to bloom. Can never have too many of these tucked into the corners. 26. The giant Madeira geranium, Geranium maderense, most commonly has garish hot-pink flowers but this is the refined, and rare, white form. It grows into a 1m-wide bush one year, then smothers itself in flowers the next. Then, more often than not, the blimming thing carks it. You can get it from Terry Hatch at Joy Plants. 27. The first of my (million or so) sweet williams. Yay! I have heaps of old-fashioned tall dianthus for picking. 28. Here’s a show-off shrub. A posh shrub. A fancy-pants, bet-no-one-else-has-it sort of shrub. It’s Calycanthus ‘Hartlage Wine’ and it’s divine. It’s deciduous, so when the spring foliage comes out it’s lavishly lush and lime-green, with sultry blooms of darkest claret. Mine cost $50 each, and were worth every cent. They’re just coming into bloom now. 29. Viburnum ‘Summer Snowflake’, a compact viburnum that gets better every year. I’ve gone a bit mad for viburnums this year, with six new plants sitting in the driveway awaiting planting. 30. The red geum ‘Mrs Bradshaw’ is an oldie but a goodie, but its new double-flowered electric orange cousin ‘Fireball’ is even better. I think it’s fabulous. 31. The snowball tree, Viburnum opulus ‘Sterile’ has flowers of lime that age to pure white. I wish it lasted better in the vase. I suspect you need to treat the stems somehow because mine always hang their heads in shame by the following morning. 32. You’d have to be a miserable so-and-so not to melt a little at the sight of spring poppies. Mine (all self-sown) are mostly red, but also come in baby pink, white, orange and scarlet. 33. One of the very first perennials I ever fell in love with was Solomon’s seal, Polygonatum multiflorum. It grows like a weed in Mum’s garden, and I’m thrilled to report that it’s finally, after a couple of years of desperate coaxing, heading in that direction here too. So graceful it is, like a ballerina but with several dozens pairs of white slippers slung over each arm. 34. Fond. Yes, I’m very fond of the little perennial viola ‘Maggie Mott’. Not awestruck or smitten or infatuated or anything stronger than fond, but there’s nothing wrong with fondness! 35. Verbenas do well here in summer. At least, the ones that Jack Frost doesn’t murder do well. Not sure how these two escaped his attentions last winter. 36. At the end of our driveway there’s an anonymous red carpet rose that manages to bloom in the gloom beneath a copper beech tree. It looks very much like Flower Carpet Red in bloom, except the single flowers are borne from these perfect buttonhole buds. 37. ‘Souvenir de Mme. Leonnie Viennot’ – an old-fashioned rambling rose that’s the perfect choice for any farm gate. 38. The ornamental cherry Prunus ‘Shimidsu Sakura’ has these flouncy fat blossoms, but it’s hit and miss here. My two trees only have about half a dozen clusters of blossoms each because the rotten rosellas eat them. 39. This is the best dark purple lavender. And I’d love to tell you its name but I can’t because I’ve forgotten it. I think it was in the Bee series. But then again, perhaps it was just a random purchase. I’ll never know. 40. Another wallflower, sold to me as ‘Bowle’s Mauve’ but quite a bit paler. 41. Self-sown viper’s bugloss, Echium vulgare. It’s a weed, frankly, and bristly. 43. And the lucky last? Dark burgundy aquilegias from the ‘Tower Double’ series. They look like multi-layered Victorian ladies’ bustles and seem to come true-ish from seed, as they’re popping up all through my paths. Gotta love a freebie! To beat the wasps, I’ve been experimenting with a scent barrier: sweet pea vines around my swan plants. Metamorphosis. It’s the longest word in my three-year-old son’s vocabulary, though it’s only a matter of time – thanks to a muster of monarchs – before he masters the pronunciation of prestidigitation. Egg, caterpillar, chrysalis, butterfly: it’s an enchanting cycle of everyday magic, conjured up in your own backyard for the price of a swan plant. A cheap trick, but one no less satisfying however many summers you’ve seen it. Wisdom, said Socrates, begins in wonder. Be curious, said Stephen Hawking. Watch out for wasps, I say to my kids, for nothing deflates childhood delight quite like the sight of German yellowjackets gorging barbarically on monarch butterfly caterpillars, mining their chubby carcasses for protein. As an organic gardener, I’m loath to intervene in the natural order of things. But unlike those wildlife photographers who stand by, cameras rolling, as bewildered baby wildebeest are ripped to bits by lions, I also can’t bear to witness the carnage. So last spring, when I planted my swan plants – 16 milky-sapped clumps ofGomphocarpus physocarpus in a four-square-metre bed – I sowed scented sweet peas around the perimeter at the same time. To be honest, I wasn’t thinking about wasps the first time I paired these two plants. I was simply trying to hide the plainness of the swan plants. For the first half of the season, before the butterflies descend, these boring green bushes are bereft of any notable beauty. Their itty-bitty white flowers are as elegant as phalaenopsis orchids, but they’re too damn small to add any real decorative appeal, which only leaves the puffy seed pods as a point of difference. Some gardeners compare swan plant seed pods to balloons and cotton balls, but their common name comes from the flocculent, swan-like wings the ripe pods produce when they split open. Truth be told, I’ve always found swan plant seed pods rather more testicular in appearance. If only the English common name of bishop’s balls had caught on here. To recap: ordinary foliage, insignificant flowers, pubic pods. And that’s even before you factor in how gruesome swan plants look once they’ve been chewed bare by very hungry caterpillars in late summer. So I figured, why not plant them behind a barrier of something pretty like sweet peas instead? I had a hunch that it might look nice, and it did, as by late summer my sweet pea vines sport scores green and gold chrysalises, like rows of greenstone pendants in a souvenir store. But the real beauty of this experiment? The wasps now leave them well alone. Was the sumptuous scent of all those old-fashioned sweet pea petals simply overpowering, like the original Poison perfume, or had I inadvertently stumbled upon a completely non-scientific, but nonetheless surprisingly effective, natural wasp deterrent? There was silence at the other end of the line. I suspect he thought it was a trick question. “No,” he said, adding, because he’s a smart marketer as well as a brilliant plant breeder, that now’s the perfect time to sow seeds of his lovely ‘Solstice’ series of winter-flowering sweet peas, which you can order direct from www.drkeithhammett.co.nz. Update: My sweet pea vines finished flowering this week, and what did I find this morning? 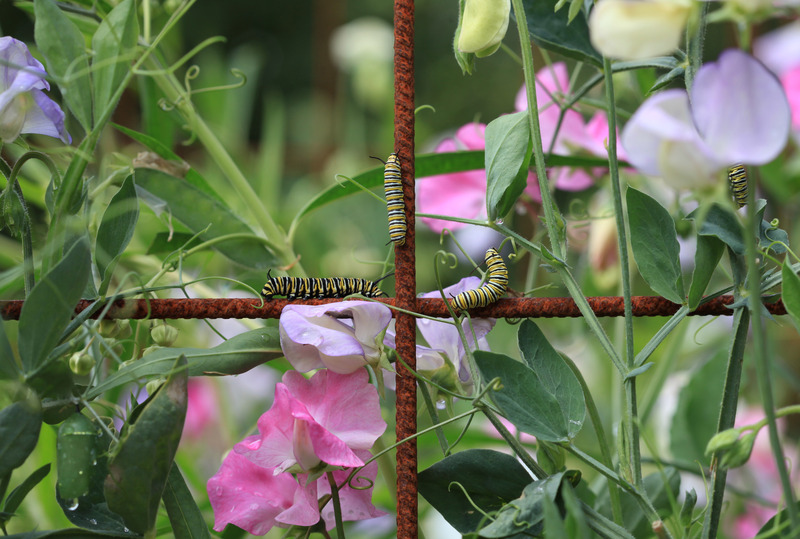 About half a dozen formerly chubby but now parasitised monarch caterpillars, their striped pyjamas hanging forlornly on the plants. Gawd, it’s such a depressing sight. One of the pleasures of making your own cordials is that you know exactly what’s in them (no artificial flavours or sweeteners, for starters). You can also make them as sweet or as sour as you like, and dilute them to your liking with water or sparkling soda water (or champagne for special occasions). 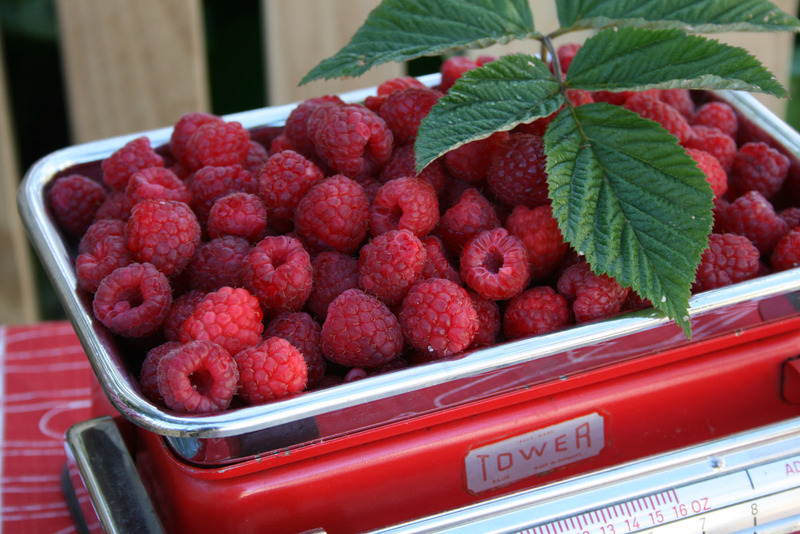 My Mum, Marjorie, isn’t a hugely keen gardener but she sure has the knack with raspberries. She has a big wild bed of dual-cropping ‘Aspiring’ raspberries (as well as grapes and blueberries) in an old shadecloth-covered grow house. Mum freezes at least 10kg of berries each year, enough to supply us all with jam, raspberry shortcakes and this lovely cordial. You can also use this, undiluted, as a wonderful zingy berry sauce for ice cream sundaes or drizzled over a fresh fruit salad. a sieve, pressing the pulp with a spoon to extract all the juice. Then mix the sieved pulp with 1 cup boiling water, bring to a simmer, and strain again. Discard pulp. (By doing this, you’ll end up with very little seedy waste) Return liquid to the pot; simmer for 2 minutes, then bottle. Keep in the fridge. Make your own Damson gin. Drunk plums: it just doesn’t get better than that! It’s easy to steep the small, sour, purple fruit of ‘Damson’ plums (and other small stonefruit, such as cherries) in booze. Just wipe their skins clean, prick them once with a kebab stick, and pack into large glass preserving jars. 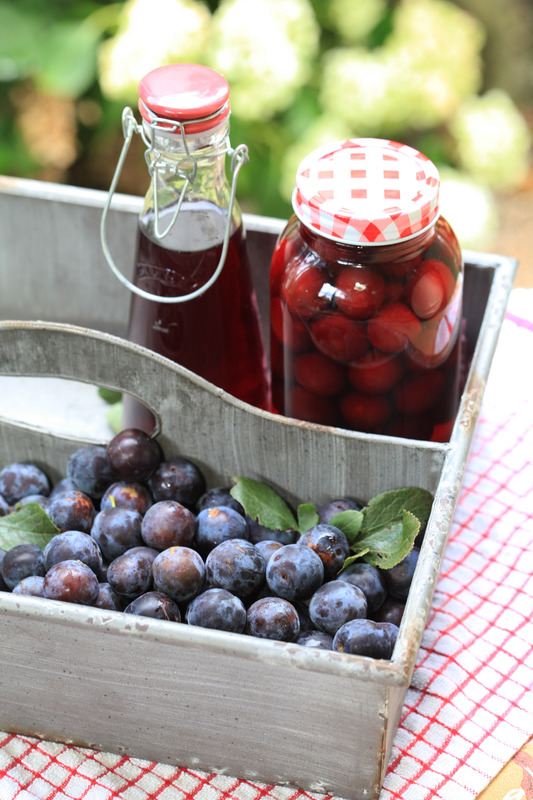 For every litre jar of plums, add up to 1 cup sugar (just shake it into the jar to fill up the gaps between the plums). Then top up with cheap gin. Steep for at least three months, shaking every few days until all the sugar has dissolved. After six months or so, strain and taste. If the liqueur isn’t smooth enough for your liking, add a little extra sugar syrup. Then devour the wrinkly plums: they’re wonderful served with a creamy rice pudding for a decadent dessert, or on your winter porridge, or drained, patted dry and dipped in melted chocolate for homemade truffles. Damson gin is one of my favourite things to have in the pantry, not least because a bottle of plonk makes a fabulous (and almost universally appreciated) emergency gift when you need one for a dinner party, forgotten birthday or anniversary… and you can’t be bothered driving to the shops. 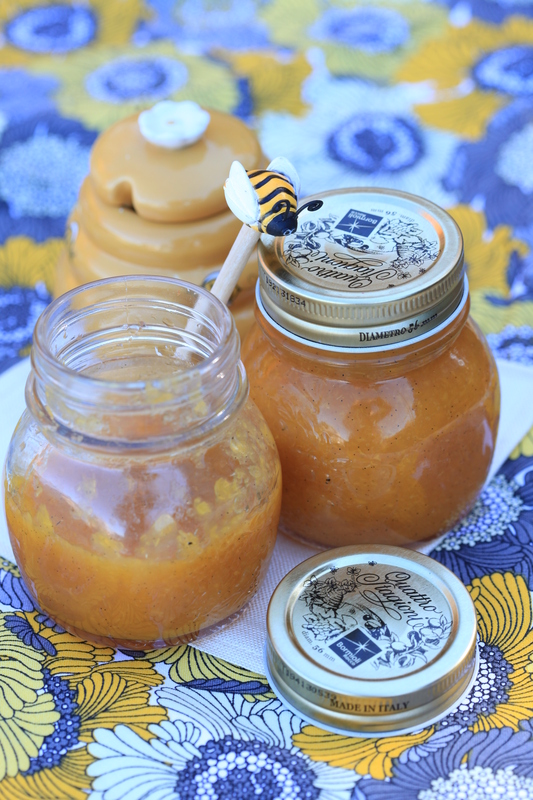 Bottled peach, vanilla and honey spread: delicious on hot, buttery crumpets. Peel and slice ripe, but firm peaches. Pack into preserving jars with screw-on seals and bands. Top with boiling water (peaches are sweet enough to preserve without using sugar syrup). Screw on the seals gently. Submerge in a large, deep pot of boiling water so that the tops of the jars are about an inch under the surface. Simmer for 20 minutes or so (when they are cooked, you’ll see the bubbles rising inside the jar). Remove from the water bath and carefully screw the lids up tightly. When you want to make a peach spread for your toast, open a jar, strain off the liquid, then puree the fruit with a hand-held blender. Add a teaspoon of vanilla paste (not cheap extract) and bring to the boil in a small pot. This is scrummy as a spread on buttered crumpets… and even more delicious if you melt a couple of tablespoons of your favourite honey into the mix. Spoon into a jam jar and store in the fridge; the honey sets the preserve when cold. 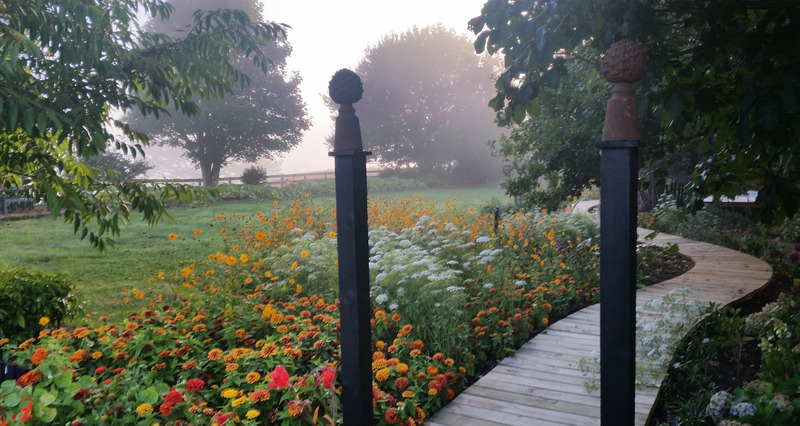 The boardwalk along our lawn meanders off into the mist. Summer’s officially over. How can I be so sure? 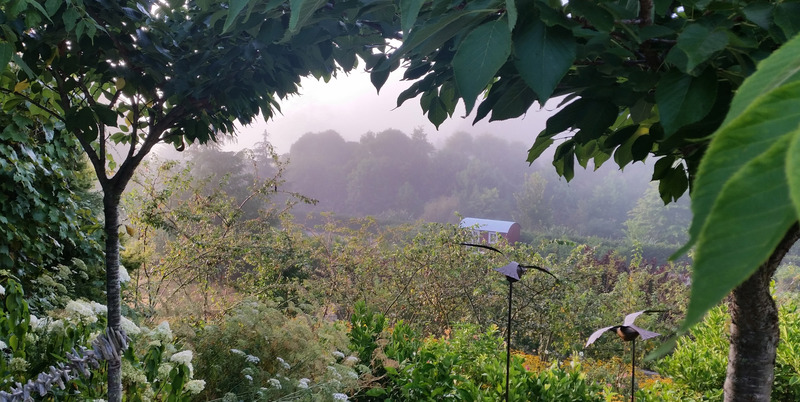 Because, like clockwork, as soon as the calendar flicks over to March, the fog rolls in around the Hunua Ranges and we wake here to a marvellous cloak of mist every morning. It’s all rather poetic, even if it does mean that it’s time to shake the spiders out of my gumboots again. I can no longer sneak out to feed the chooks each morning wearing my jandals. The dew-drenched grass is super slippery when wet. (*I realise it’s actually autumn here in New Zealand, but I can’t resist a bit of alliteration). The view through the cherry arch down to the arena garden. ‘Tomatoberry’ cherry tomatoes: super sweet (and self-sown from last season). Gosh, time flies when you’re having… ahem, babies. It has been almost 18 months since I last updated this blog. Suffice to say that when you’re juggling a writing career, a bit of broadcasting, a ridiculously large garden, two toddlers, a husband (not that I could actually juggle mine, what with him being 6ft4in tall and tipping the scales at 115kg), two kunekune pigs, eight chooks, four cats, two dogs, some cattle and a dozen or so sheep… life gets a bit busy for blogging too. But my youngest son, Lachie, turned two yesterday, and when he blew out the candles on his (storebought) birthday cake, I was sure I could see the light at the end of the toddler time-evaporating tunnel (I’ve even ceremoniously biffed the high chair and given the cot away), so I’m back. Apologies to all of you who have asked unanswered questions in my absence (though I’m not so sorry about the 278,853 spam messages in my trash). And with that in mind, I thought we could kick things off with a free-for-all gardening advice session. Got a tricky question? Hit me with it! Here’s a perplexing problem of my own. In my absence, I also developed a serious contact allergy to tomato plants. 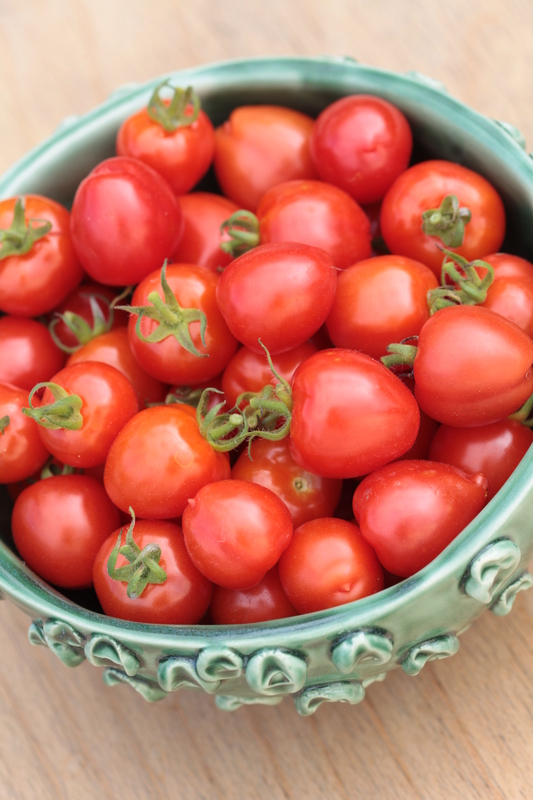 (I know, who has ever heard of a gardening writer who was allergic to tomatoes?) But I can’t touch them without my hands swelling up and erupting in an angry, and insanely itchy, rash of blisters. I should know better, but this morning I picked a lovely basket of self-sown ‘Tomatoberry’ cherry tomatoes. And I thought I was careful, but I wasn’t careful enough, which is why I am up late on the computer instead of sleeping. It’s either type or scratch my hands off.